It will be exactly two weeks from now that the US and the world will know who will be the next US President to lead for the next four years. The latest polls from Gallup, the Washington Post, Ipsos and Ramussen put Senator Obama on 52 per cent, 53 per cent, 48 per cent and 50 per cent to Senator McCain’s 42 per cent, 43 per cent, 39 per cent and 36 per cent nationally. 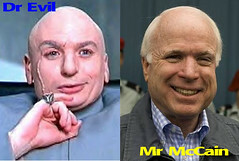 Will it be the Democrat, Mr Barack Obama or the Republican, Mr John McCain? If you are clueless who they are and what they stand for, you can visit this site for an overview comparison of their plans and policies. But on a personal note. Whoever it might be, it beats having Mr Bush around. Thanks to his leadership, whoever becomes the next President will inherit a big mess to clean up.